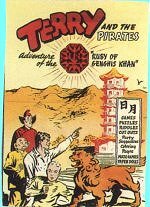 THE FAMED COMIC STRIP CREATOR MILT CANIFF brought the action-packed adventure Terry and the Pirates to American's attention in 1934. The daily strip initially depicted a boy's adventures in the Orient in search of a lost gold mine, and it advanced as time went on to show the young hero, Terry Lee, growing up and joining the US Army Air Force during the Second World War. With storylines of action, high adventure, and foreign intrigue, the popular comic strip was easily adapted to radio and enthralled listeners from 1937 through 1948. 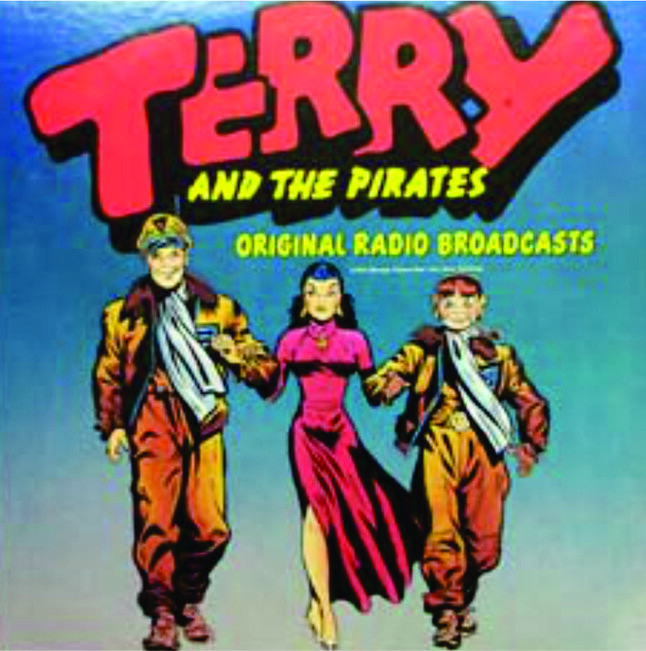 The first radio serial version of Terry and the Pirates ran three afternoons per week for Dari-Rich on the NBC Blue network from 1937 to 1939. It was moderately successful. Absent from the airwaves for over two years, it returned shortly before the Pearl Harbor attack and was heard in the Midwest on WGN. That series aired five days a week from October 16, 1941 to May 29, 1942. In 1943, a revived five-day-per-week serial began on the Blue Network, and it then moved to ABC. Terry and the Pirates had high ratings, second only to Jack Armstrong. The first run of the show in the late 30s is considered lost, but many of the 1940s episodes are are still around and are just as exciting today as when kids who are now grandparents thrilled to hearing them on the radio. "Approaching with Care," which was broadcast on November 26, 1941 and has an an advertisment for the Terryscope. The central character Terry Lee is a young teenager who lives in the Orient, and he's surrounded by some of the toughest friends a boy could imagine: Pat Ryan, Terry's best pal; Flip Corkin; Hotshot Charlie; Connie the Coolie; plus females Burma and Elita, who also could fight. Terry Lee, was portrayed at various times by Jackie Kelk, Cliff Carpenter, Owen Jordan, Bill Fein, and William Tracy. Bud Collyer, who was Superman on radio, was one of several playing Pat Ryan. Actress Agnes Moorehead was one of the incarnations of the Dragon Lady, who led “the pirates" and terrorized the Orient for many years. The casts were solid; the acting was great fun; and the music and sound effects were action-packed. Sponsors were Libby or Quaker. In the 1940s, Terry and his pals are plunged into the War effort to fight not only "Japs" but Nazi spies as well, both of whom were present in the Orient. With increasing popularity during the WWII years, the show took off at a fast pace on ABC Blue, airing daily for 15 minutes on weekday afternoons beginning February 1, 1943. The sponsor’s commercials often had a patriotic pitch. 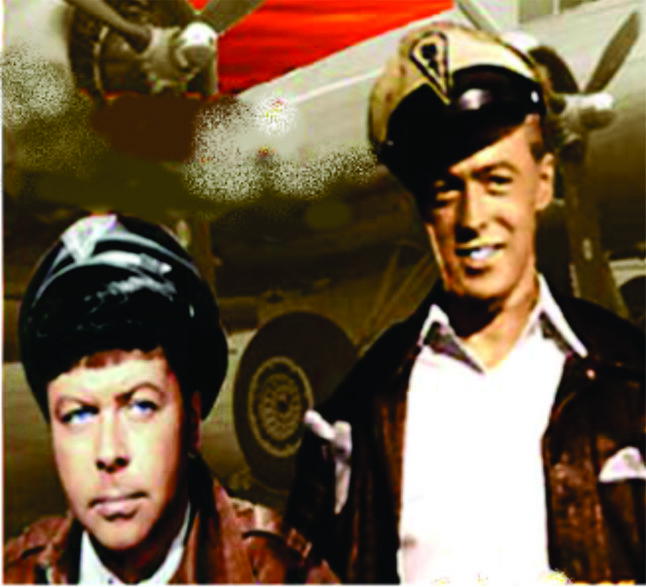 After 1945, with no wartime villains for Terry and his pals to fight, ratings began to drop in the post-WWII period until the final episode aired on June 30, 1948. The TV series picks up more or less where the comic strip was in 1946-47, in post-World War II China. Though filmed in 1953, the show was clearly set in the period between the end of the war and the takeover of the country by Mao's forces in 1949. Tracy, not forgotten,was cast as Terry’s sidekick and co-pilot, Charles W. Charles, also known as hotshot Charlie. The television production lasted six months. The Terry-Scope was used, with great success, during several adventures of Terry and the Pirates which made it a very desirable premium. With the marvelous toy, the owner could look around corners and behind themselves and could even peer over walls. The airplane spotter was made of two cardboard disks with a shiny metal grommet at center holding them together. The front disk has a die-cut window where plane silhouettes can be viewed. The reverse included illustrations and detailed information on 16 different planes. The long pencil has metal end cap holding a loop of bright yellow cord. Each pencil side pictures the character and reads “Big Stoop’s Code Writer.” The lead is in 4 separate colors: red, orange, green and blue. In the comic strip, Big Stoop is a 9’ tall Mongol who Connie helped when he was being picked on by bullies. He sticks with Terry and friends out of gratitude. Immensely strong and mute, his nickname comes from “he stoops to conquer.” The strip reveals he was once a servant of the Dragon Lady who cut out his tongue when he was young, earning her his hatred. He works with Connie in the Chinese resistance during the war. 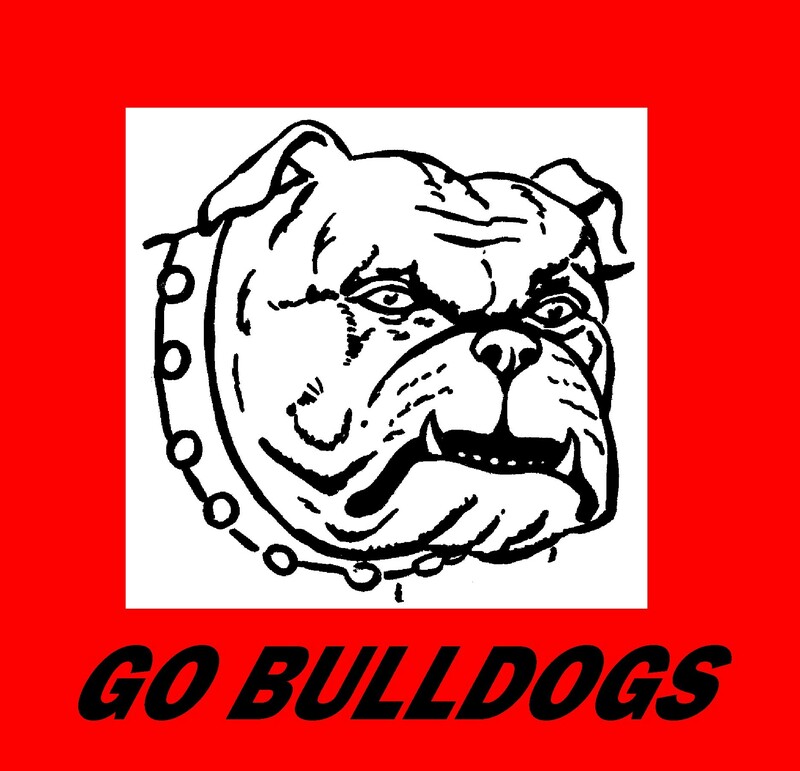 Kids could become an Army bomber pilot good luck mascot by promising to buy a war stamp. For two boxtops you received a color picture of a B-25 bomber, a pin saying you were a good luck mascot, and your name on a roll of microfilm to be carried in a real B-25 for good luck. The microfilm said: "Good luck and drop one on the Japs and Nazis for me". The picture has a shield on the lower right inscribed with "Shield Of Honor" with the name of the person who ordered the premium typed in. 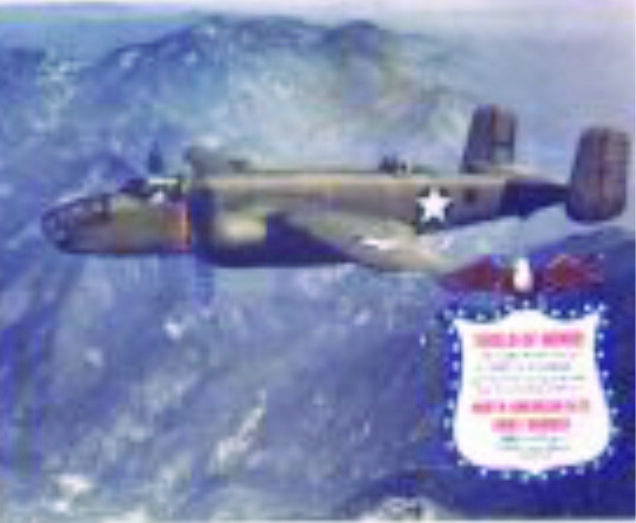 Additional text reads: "This Certifies That The Name Of (typed entry) And Good Luck Message To The Pilot Have Been Sent Along To War In A North American B-25 Army Bomber" followed by the facsimile signature of the "President of North American Aviation, Inc."
The button is a high domed painted wood with text "Pilot's Mascot/North American B-25 Army Bomber." Six paper pictures, each 7-1/8x9-1/8,” with choice specialty art by creator Milton Caniff. Characters include Terry, Dragon Lady, Burma, Pat Ryan, Phil Corkin and Connie. The top 1000 winners also would receive $5 in war stamps. The ring had the ever-popular feature of glowing in the dark and on each side had an engraving of a crocodile. The brass base has adjustable bands with small images of dragons. 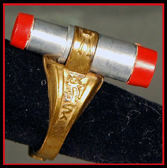 A brass band, holding a hollow silver cylinder capped with red plastic, has a skull and crossbones design. When the tube is held to the light and viewed, the interior shows dark irregular shapes representing gold ore against a frosty background.